What are your 4 pounds made of? I don’t know what you had for lunch today, but I had 18 apples. What do you think of that? You probably think I’m a glutton and have the GI tract of a gorilla. 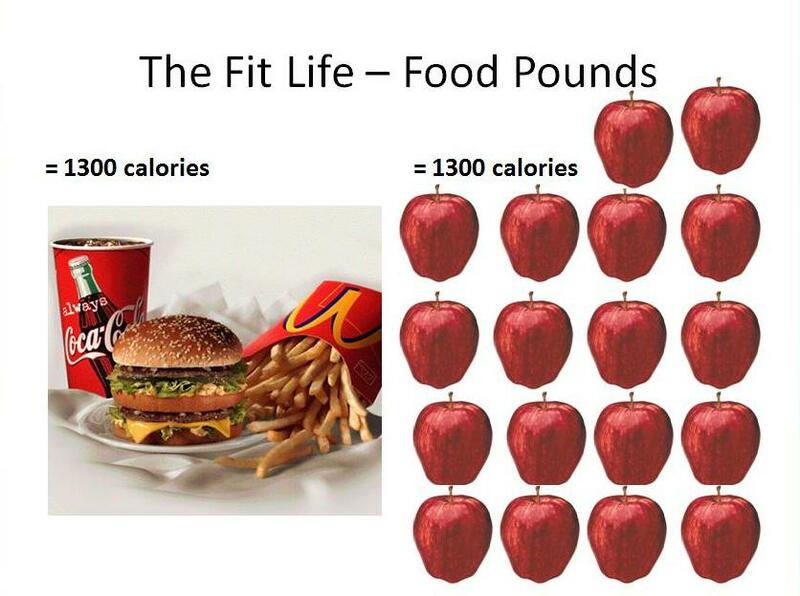 But check this – a typical fast food value meal has the same amount of calories as 18 apples. 18! So I wanted to see what would happen if I downed the same amount of calories from apples. Yet I’ve had buddies knock back 2 value meals while watching Monday Night Football. And no, I haven’t seen any of them go through a bag of red delicious by the 4th quarter. What does this tell me? Well, it tells me that Mother Nature has got your back. This leads me to the world of energy density. Are you familiar with it? It’s the amount of energy (calories) per unit of food. Let me explain. 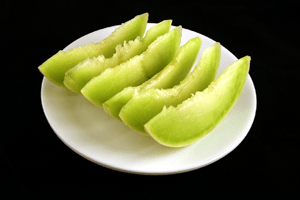 This is 200 calories of melon. This is a lot of melon. 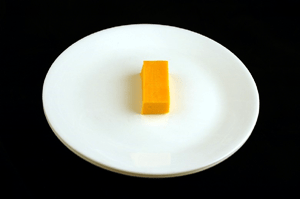 This is 200 calories of cheese. This isn’t very much cheese. 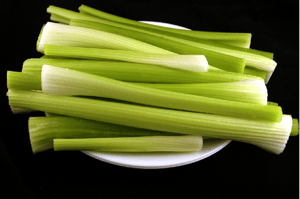 This is 200 calories of celery. Good luck eating this. 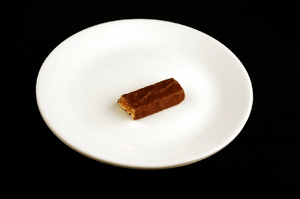 This is 200 calories of a candy bar. Good luck NOT eating this. Seeing a trend? It’s hard to rack up excess energy (calories) from whole, real, calorie-dilute foods. Interestingly, research shows that most humans eat around 3-5 pounds of food per day. Indeed, as we approach 4 pounds of food intake for the day, most of us are feeling pretty satisfied. Now, this can be 4 pounds of celery. Or it can be 4 pounds of candy bars. It’s not the food or calorie content that matters. It’s the volume/poundage that counts. And obviously, there are some big nutrient differences between celery and candy bars, right? Note: I’m showing calories only as a measurement unit to help illustrate a point. Don’t get wrapped up in the numbers. People that struggle with body fat management tend to fill up on energy dense, processed foods. This means stored energy for later. If we eat 4 pounds of energy-controlled, whole, real food – we get lots of nutrition with a calorie count that our body can handle. What if we switched this around? I’m curious: what does a day of my food weigh? Note: I was surprised it didn’t weigh more. 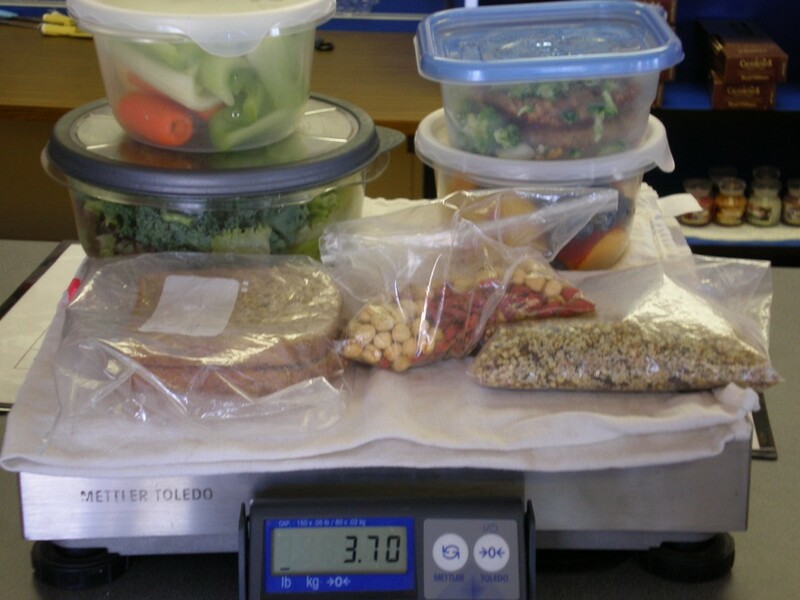 The actual food weighs less than 3.7 pounds, as the food containers contribute to the total weight. I left out condiments like salad dressing and mustard. Oh, and this was just a random day of eating. Some days I eat more, some days less. If we prioritize and eat nutritious, real, controlled energy foods – there isn’t much room left for the energy dense, fake foods. You only have about 3-5 pounds to work with each day. So… think about it…what are your 4 pounds made up of? Very good comparisons. I like the visuals!